KNIGHTDALE - Mayor James Roberson and the East Wake Middle PTA President Rita Rakestraw recognized East Wake Middle School Students at the February 22nd Knightdale Town Council Meeting for their participation in the East Wake Middle School's Reflections Contest. The Mayor and PTA President handed each student their Certificate of Excellence in the areas of Literature, Photography, and Visual Art, while also getting a picture with the Mayor. East Wake Middle School 7th grader Jayden Bond who also submitted his piece and won at the county level, will now go on to the state level for his artwork, a captivating comic strip. 7th grader Victoria Crummy came in as a runner up on the Wake County Level for her visual art submission. 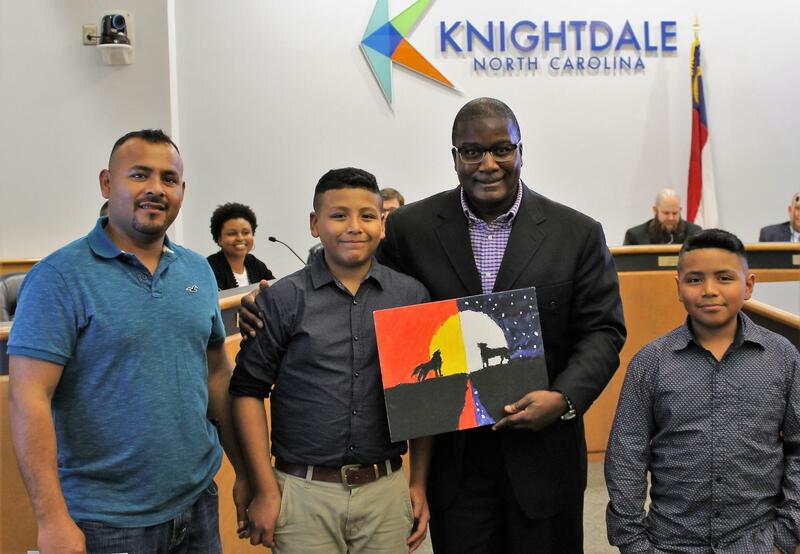 "The Town Council, Knightdale Residents, and everyone from this community are proud of you " the Mayor stated as he recognized the talent of all the students in the room. After Presentations and Recognitions, one young man stayed after to listen to the ongoing Town Hall discussion. Brian Castro-Zapete then asked to present Mayor Roberson with his piece, which the Mayor graciously accepted. The Reflections Program is run by the North Carolina Parent Teacher Association (NCPTA) and is a State-Wide Program that is meant to "Encourage creativity and lifelong learning while offering recognition for artistic endeavors. The PTA Reflections Program is designed to enhance quality arts education for students in preschool through grade 12." "The NCPTA is the state’s oldest and largest volunteer organization advocating for the education, health, safety and success of all children and youth while building strong families and communities. PTAs across North Carolina impact more than 685,000 children and their families." If you would like further information, please contact Jonas Silver, Public Information Officer at 919-217-2202 or jonas.silver@knightdalenc.gov.